Two reasons: 1) The cost. The two prescriptions cost about $130 a month. That's the amount not covered by my high-deductible insurance. It's a lot of money to pay every month. 2) I'm the type of person who doesn't like to take medication of any variety. My idea of a pain killer is ibuprofen. And with all the conflicting messages about hormone replacement therapy, I didn't want to stay on it any longer than necessary. 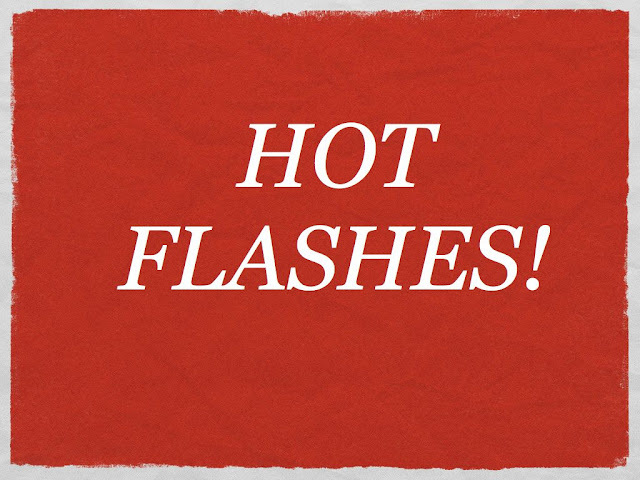 I stopped using the hormones last September and immediately began taking an over the counter 'all natural' alternative containing black cohosh, an herbal remedy for hot flashes. This protocol has worked for many women. I tried it for three months, hoping it would work for me. After three months of increasingly uncomfortable hot flashes, I gave in yesterday and renewed my prescription of hormones. In some ways I felt like a failure, or that my body had failed me by not responding to a natural remedy. Am I concerned about the risks of using hormone replacement therapy? Absolutely. And when I go in for my annual check up in March, I plan to discuss my dosage and how long I may need to continue on this prescription with my doctor. On the other hand, I am relieved to be going back to a therapy that allows me to simply feel normal again. I believe it speaks volumes about how devastating the symptoms of menopause are, that 'feeling normal' could feel like such a victory. Why am I sharing this fascinating experience? Because as much as I find it difficult to believe that I am actually turning 51 in two months, or going through menopause, I believe it's important to share this often frustrating experience with other women so that I can learn from their experiences of this important part of our aging process. So, what say you? What has been your experience with menopause? Have natural remedies worked for you, or are you using hormone replacement therapy? Thanks for sharing your experience! A friend of mine has been going through the same thing. She too wants to manage her symptoms naturally. She's found the Women to Women clinic (www.womentowomen.com) in Yarmouth, Maine to be really helpful. They're working with her on diet & life style changes, as well as supplements to ease symptoms. Good luck with yours! Yeah I remember my wife who also suffered from hormone replacement therapy, but that was before we decided to prescribe from online Viagra. I’m glad we’ve been blessed with 1 angel before she got menopause.